Wrap 6 sugar cones with non-stick tin foil. Alternately, you can also use metal cream horn forms, if you have them. Unroll a tube of Pillsbury™ Crescent Recipe Creations™ refrigerated seamless dough sheet on a cutting board. Use a pizza wheel or knife to cut the sheet into a nice rectangle. Cut that into 8 even strips, lengthwise. Wrap one strip of crescent roll dough around each sugar cone leaving a little bit hanging off at the pointed tip. Cut the remaining two strips of dough in half lengthwise. Twist two of those strips together. Cut the twisted strip in three pieces. Repeat. Brush egg wash over the wide edge of dough on each cone. Wrap one twisted strip around the wide end of each dough wrapped cone. Press to seal the edges together. Set wrapped cones on a non-stick tin foil lined baking sheet. Brush egg wash over the dough. If youd like your cornucopia to have a curved tip, roll up some tin foil and set it under the tips. Refrigerate for 20 minutes. Meanwhile, heat oven to 400°F. Bake for 9-11 minutes until nicely golden brown. Allow to cool for 2-3 minutes, then remove the cone by twisting it and pulling it out of the crescent roll. Allow crescent roll cornucopia to cool completely, about 10 minutes. Toss together turkey, mayonnaise, celery, red onion, and dried cranberries. Stuff crescent cornucopias with turkey salad. Set cornucopia on lunch plate. Add more turkey salad spilling out of the cornucopia and serve. The cornucopia is a symbol of abundance and nourishment – what better time of year to celebrate that than Thanksgiving? We usually have an abundance of turkey left over the day after Thanksgiving. If you’re like me, you’ve grown tired of plain turkey sandwiches. Last year on Black Friday,I stayed home while my family was out shopping (I don’t like crowds) and prepared lunch for everyone. I tossed together a turkey salad and decided to have some fun with it. I had a few rolls of Pillsbury Crescent Roll Seamless Dough Sheets in the refrigerator and used them to make mini cornucopia! They came together really quickly, but looked like they took a lot of time to make. Everyone loved them! They looked so pretty on the table stuffed with turkey salad. 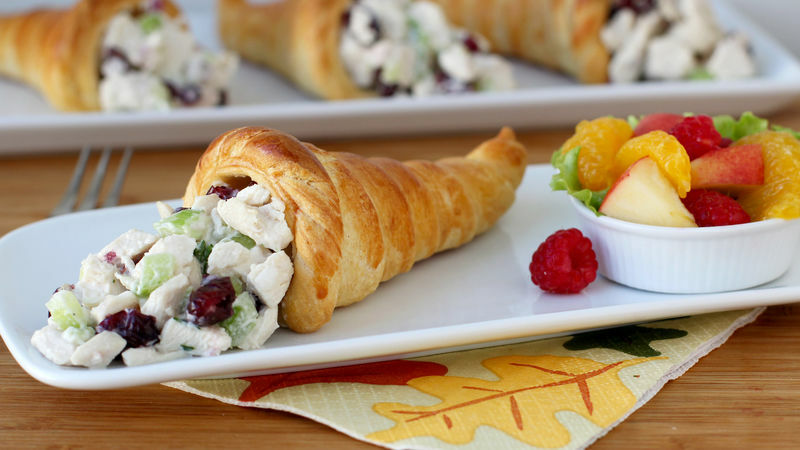 These Crescent Roll Cornucopia make such a lovely lunch for a beautiful fall day...I just had to share how to make them! Unroll a tube of Pillsbury Crescent Roll Seamless Dough Sheet on a cutting board. Use a pizza wheel or knife to cut the sheet into a nice rectangle. Cut that into 8 even strips, lengthwise. Wrap one strip of crescent roll dough around each sugar cone, leaving a little bit hanging off at the pointed tip. Cut the remaining two strips of dough in half, lengthwise. Twist two of those strips together. Cut the twisted strip in three pieces. Brush egg wash over the wide edge of dough on each cone. Wrap one twisted strip around the wide end of each dough-wrapped cone. Press to seal the edges together. Set wrapped cones on a non-stick, tin foil-lined baking sheet. Brush egg wash over the dough. If you'd like your cornucopia to have a curved tip, roll up some tin foil and set it under the tips. Refrigerate for 20 minutes. Meanwhile, heat oven to 400 degrees F.
Allow to cool for 2-3 minutes, and then remove the cone by twisting it and pulling it out of the crescent roll. Allow crescent roll cornucopia to cool completely. Toss together turkey, mayonnaise, celery, red onion, and dried cranberries. Stuff crescent cornucopias with the turkey salad. Set cornucopia on lunch plate. Add more turkey salad spilling out of the cornucopia and serve!